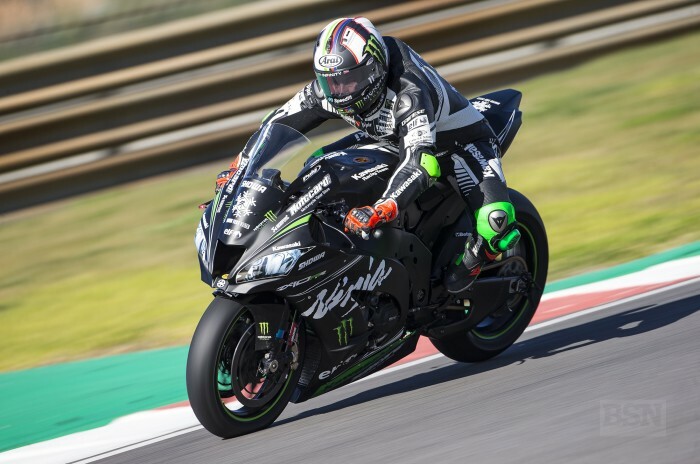 After tests at Aragon and Jerez twice on his official KRT Kawasaki, a first track outing at Portimao on the Ninja ZX-10RR was largely a new experience for reigning BSB champ Leon Haslam. The transfer from relatively-flat Jerez to the rollercoaster Portimao proved relatively straightforward for Haslam, even if his ultimate day one pace in testing was not quite enough to see him nestle into the top three places. “The times came quite well,” Haslam told bikesportnews.com. “We lost the last hour, I would say. We had a little issue at the end and we did not get the chance to put a decent tyre or decent time in. On the subject of tyres, Haslam feels it may be the time to try out some new tyre options, as he has spent almost all of his laps working on bike setup, so has missed the chance to evaluate other possible options. “I have just had a meeting with Pirelli and I have not actually tried any different tyres since I have been on this bike,” said Haslam. “So, the final day might be the day that I try a different front and different rear. Other riders have found a benefit. Haslam feels confident of his progress so far, even enough to say that if everything goes smoothly from now on he will be ready for the first round at the end of February in Australia. “Yes, but every track is different. I think the biggest hurdle that we have got to overcome is to going to each a new circuit, have three forty minute sessions and then go racing. Testing is a little bit different.